I made a youtube video tutorial for firefox improving it right from a fresh install. The media manager, firefox forward button, stop button, and profile have no quick key, as far as I know. While your writing in your favorite forum using firefox you can use several editing quick keys. CTRL+Z is undo, so if you accidently delete a paragraph, CTRL+Z becomes your best friend. Shift+CTRL+Z is a redo button, so if you write something and click ctrl+Z one too many times and it eats another paragraph, you can fix it all with Shift+CTRL+Z. Before posting anything on a forum, add your post to the clipboard with an infinitely short but stress saving key combination. CTRL+A (select all) CTRL+C (copy). This way if your comp got unplugged or disconnected, or if the server just went down, you'll have a copy of your work that you can post again later (though rewriting almost always turns out a more elegant phrasing). UPDATE: Here's a bigger list of firefox quick keys by CNET. Head over to the firefox most popular skins page. I personally like the whitehart theme best. Spend some time testing out themes you like. Right click your toolbar and click customize. Remove and add objects to take up less room. 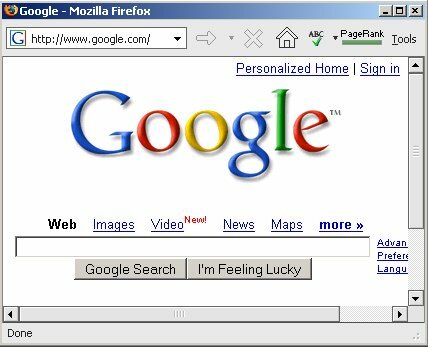 The firefox toolbar doesn't have to be bulky. This is my ultra minimalist firefox setup with the navigations and bookmarks toolbar disabled (unchecked). I'm not saying you should do the same, but showing people that firefox can look clean and doesn't have to look bulky with tons of extensions. I have google spellcheck and google pagerank, which are incredibly useful. The back button has been removed since I can just click backspace, and so has the refresh button (F5). The rest of the buttons regular toolbar buttons have been removed, eg. file, edit, bookmarks, view with a userChrome.css hack that goes in C:/Documents and Settings/your name/Applicationdata/mozilla/profiles/somerandomfolder/chrome/. Renabling the default userChrome is easy though, just delete it. Many extensions cause memory leaks and make firefox more intolerable, but there really are some I can't live without like google toolbar for spellcheck and pagerank. Siteadvisor is great to protect new computer users from malware and customize google is really nifty. VideoDownloader is extremely useful for people who have fast connections and enjoy watching videos from youtube and google video. Rather than adblock, adblock plus, filter.G and other ad blockers I heavily recommend the windows hosts blocker. Using a firefox extention makes firefox parse (scan) the code of each page you look at then remove the ads, this makes firefox more slow/unreliable especially with large pages and many tabs. 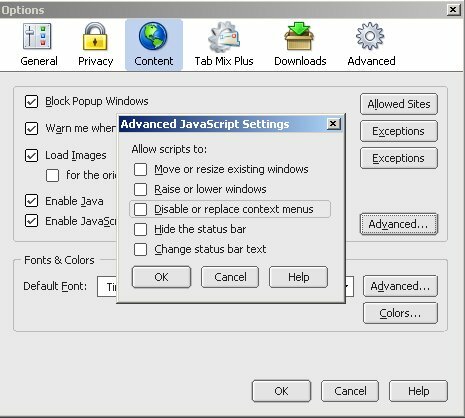 Many of these features you have to enable for them to become active once you've installed the extension by clicking tools -> Tab Mix Plus. Check out the help page. I've made a Best firefox extensions ever list. Also be sure to see the official most popular extensions list. To open your bookmarks click ctrl+B, you're halfway there. Now learn about LiveBookmarks on FIrefox. Click the little RSS button and now everytime you check your bookmarks you'll see if there's anything new or interesting that's been posted on your favorite sites. I don't like blank or redirects. This is one of the most powerful tricks hardly anyone uses. Firefox quick seaches are easy to add. For example, go to imdb.com, right click their search engine, click add a keyword for this search, set the keyword as imdb... Now type "imdb Drunken Master" in the address bar. Viola, instant search. What Quicksearches do you Have? I have a lot actually, not that I ever use them often, but when I do I feel special. There's a lot of scriptlets available to do useful things. For example, on forms sites like Yahoo Main, Passport.com and others add features to prevent you from being able to save your passwords onto your browser (form autocomplete=1). To add it you have to drag it to bookmarks 0.o... that's where people get confused. Foxit pdf reader is much much faster at opening PDF documents. There's literally like PDF download extension that warns you "this file is a pdf document and will take ages to load, are you sure you want to open it!?". Just download FoxIt, uninstall adobe reader, then go to tools -> Options -> View & Edit actions, then set Foxit as default pdf reader for the MIME type PDF. No more worrying, waiting, and lost hair from adobe crashing the browser as it disgustingly tries to embed adobe into firefox on an accidently pdf click. Most of the time firefox will crash or hang because of memory leaks, meaning the memory used by the program will continue to grow and grow. There's no reason your firefox should be using 250mb of ram and 99% of the processor (check ctrl+alt+delete with windows or type "top" on linux command line). Personally I like disabling java which I reenable if I find an applet really worth the time. Java slows down the browser and eats a ton of memory. Closing the applet page does not release the memory. Run crescendo instead of quicktime as my default midi and mp3 player. For videos run media player classic with real player and quicktime alternative. Download media player classic last from the sourceforge page, because quicktime and real alternative have older versions. There's a list of command line arguments in MozillaZine and an official help page. Most people don't need to use this but it can be useful. For example if you have some kind of key or voice macro program, you can add a command line reference to open a new tab when you click or say something. Its main benefit is for developers and webmasters who use it to access consols to debug and inspect sites or firefox itself.